Using small knife, make 1/2-inch cuts over surface of pork. 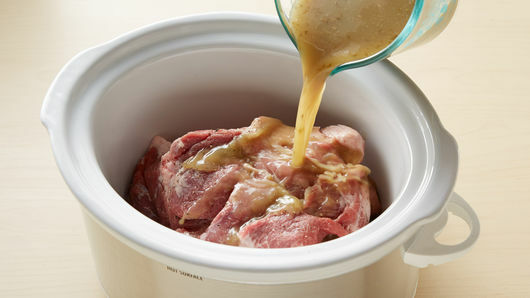 Place pork in 3 1/2- to 4-quart slow cooker; sprinkle with salt and pepper. Pour marinade over pork. If necessary, add up to 1/2 cup water so liquid is three-fourths of the way up sides of pork. Cover; cook on High heat setting 4 to 5 hours (or on Low heat setting 8 to 10 hours) or until tender. 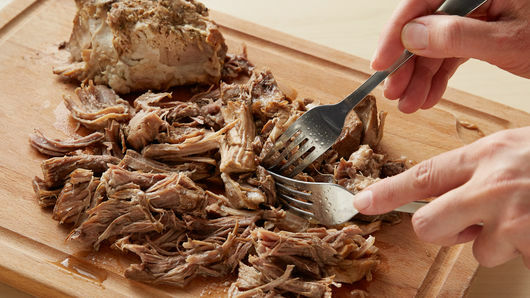 Remove pork from slow cooker to cutting board. Reserve liquid in slow cooker. Using 2 forks, shred pork into small pieces. Place pork in medium bowl; add 1/4 cup liquid from slow cooker to keep pork moist. Discard remaining liquid. Heat oven to 375°F. Spray large cookie sheet with cooking spray. Unroll dough on work surface; shape and press evenly into 9-inch square. Top dough with cheese and ham. Top with 1 1/2 cups of the shredded pork. Sprinkle evenly with pickles. Roll up square tightly; pinch seam to seal. Using serrated knife, cut roll into 10 slices, about 3/4 inch thick. Place slices cut side down on cookie sheet. Meanwhile, in small bowl, stir mustard and maple syrup until well blended. 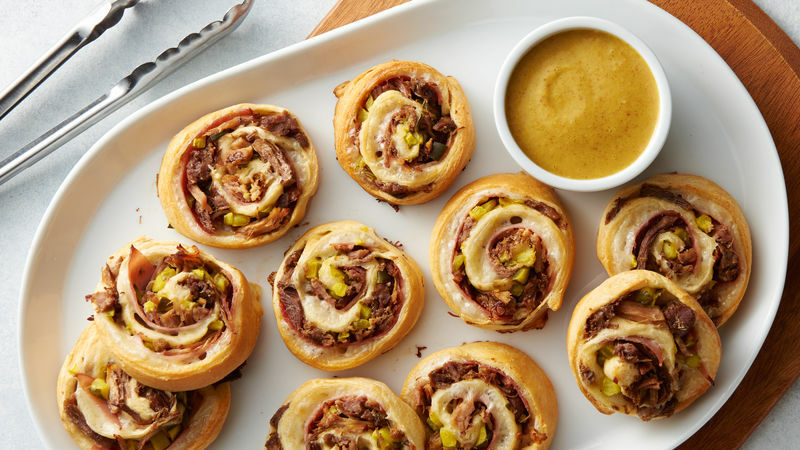 Serve with pinwheels. Refrigerate any remaining shredded pork for another use. You can refrigerate any remaining shredded pork for 3 to 5 days. Make sandwiches for lunch or toss it into pork burrito bowls! My dish represents my family, my own journey through life, and tells the story of a unique set of experiences that brought together different cultures through food. I am a first-generation American whose family fled from Cuba’s dictatorship in the late 1960s. Those who managed to escape persecution sought freedom in a new homeland, which for us was the United States. Over the years, my family connected with some extended family who had also left Cuba, and we created a new community with these relatives. Christmas Eve, or “Noche Buena,” was spent with this family and involved a longtime tradition: the pig roast. We all went to a farm and picked out the exact pig that we would be cooking. We would then marinate the pig for days in “mojo” made with hand-squeezed limes and sour oranges, fresh garlic and a seasoning mix. The pig was then put on a grate and into a box, then covered with hot coals for no less than 12 hours. Once done, the skin is crispy, the bones pull out clean and the tender meat is served with rice, beans and yucca for Christmas Eve dinner. The entire city of Miami smells of roasted pork on Christmas Eve. This smell still transports me to my childhood at Christmastime. That is the power of food. It can transport you to a different time in your life, make you feel like a child again and make you feel a family’s love better than anything else can. While this meal is delicious, the best part of it comes on the days after when we make Cuban sandwiches with the leftovers. Ham, cheese, mustard, pickles, and the leftover pork gets pressed between slices Cuban bread to make the perfect sandwich. It is just the right mix of crunchy, cheesy and tangy from the pork. 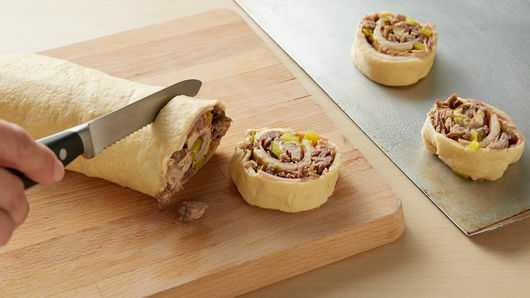 This is the inspiration for my Cuban Sandwich Pinwheels, which have also become a favorite. The maple mustard served with this recipe represents where my life has taken me since leaving Miami. I currently live in Vermont, and I now know what real maple syrup is. Though a traditional Cubano is served with yellow mustard, I put a new spin on the condiment, which symbolizes my current life.